Construction has begun on a state of the art CNG Fleet Fueling Station at our property located at 33 Maxim Road in Hartford. The joint effort between All Waste, Inc., USA Hauling and Recycling when completed will be able to fuel the newest vehicles in our fleets. CNG powered refuse and recycling trucks are due to arrive in a few weeks and are expected to be the vehicles of choice for the future. The construction can be viewed by going to the Clean Energy web site (oxblue.com/open/cleanenergy/ccp) and selecting the Hartford, CT USA facility to view the construction process. The fueling facility was designed and engineered by Clean Energy with two 300hp, 650 SCFM Compressors (1,200 SCFM total). With both compressors running the station will be capable of dispensing 9 gallons per minute and 540 gallons per hour. The station will have two dual hose CRIND dispensers designed to fuel up to four large commercial vehicles at the same time. Fleets in the area will be able to use the facility through a card reader/computer interface system 24 hours a day. All of the latest safety and monitoring equipment is being installed including a video training monitor incorporated in both dispensers that shows all new fleet operators exactly how to fuel. Planning for the project began in 2011, with the permitting process commencing in April. It is expected that the facility will be operational in December of this year, and open to the public during the 1st quarter of 2013 pending successful permitting from the City of Hartford. Clean Energy Fuels Corp based out of Seal Beach, CA, is currently building the CNG station and will be responsible for operation, maintenance, billing and marketing. 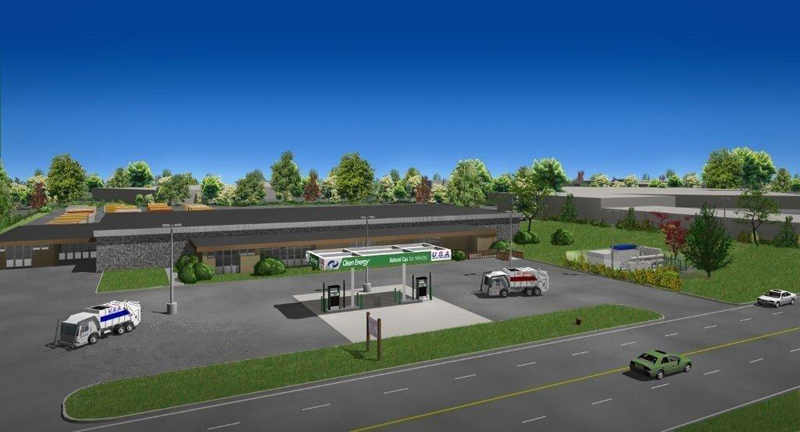 Their expertise and track record building fueling stations across the country will help create a safe and efficient source of CNG for fleets operating in the Hartford area. Inquires for the future use of the facility and any information as to the construction process may be directed to Robert Norton, Project Coordinator for the All Waste, Inc./USA Hauling and Recycling, Inc. partnership.